A Little Night Music is a musical with music and lyrics by Stephen Sondheim and book by Hugh Wheeler. Inspired by the Ingmar Bergman film Smiles of a Summer Night, it involves the romantic lives of several couples. It's title is a literal English translation of the German name for Mozart's Serenade No. 13 for strings in G major, Eine kleine Nachtmusik. The musical includes the popular song "Send in the Clowns". Since its original 1973 Broadway production, the musical has enjoyed professional productions in the West End, by opera companies, in a 2009 Broadway revival, and elsewhere, and it is a popular choice for regional groups. It was adapted for film in 1977, with Harold Prince directing and Elizabeth Taylor, Len Cariou, Lesley-Anne Down and Diana Rigg starring. This completely new edition, created with Sondheim's approval, contains 13 newly edited and engraved songs based on the composer's piano/vocal manuscript sources. Includes: Now - Later - Soon - Remember? - You Must Meet My Wife - Liaisons - In Praise of Women - Every Day a Little Death - Night Waltz - It Would Have Been Wonderful - Send in the Clowns - The Miller's Son - The Glamorous Life. Written for A Little Night Music, but now an iconic part of our cultural fabric, this lush, beautiful arrangement of Stephen Sondheim's memorable song is a simply breathtaking in its subtle textures and rich harmonies. More than a few critics consider this the greatest Broadway song ever written. 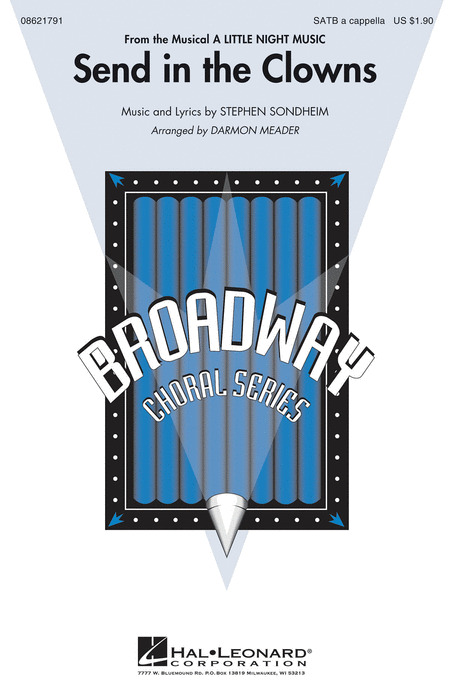 This a cappella arrangement is stunning and certainly worthy of Stephen Sondheim's brilliant music and lyrics and could be performed by SATB choirs of any size, including concert choirs. A breathtaking selection for any concert!